As many of you have probably noticed, here at Leyendecker, we’re big fans of TED Talks. While officially packaged and branded TED Talks have only been accessible to us for about ten years, the conference is actually 30 years old. In 1984, American architect Richard Saul Wurman hosted a gathering of people to explore the then new convergence of technology, entertainment and design (TED). In what he was hoping would be the “ultimate dinner party,” guests were treated to a demo of the brand new Macintosh computer, the Sony compact disc and an e-book. Using his new theory of fractal geometry, mathematician Benoit Mandelbrot spoke about how to map coastlines. Taking a financial loss on the event, Wurman didn’t attempt another such gathering until 1990. He rebooted it as a more formal, invitation-only conference and began holding it annually in Monterey, California. Content, speakers and attendees steadily grew more diverse. The secret of TED slowly got out, while access to the exclusive event remained elusive. In 2001, Chris Anderson, media entrepreneur and owner of the nonprofit Sapling Foundation, struck a deal with Wurman and bought TED. Anderson was a long-time fan of TED and had a vision for extending its reach and influence globally. Anderson folded TED into Sapling, turning it into a nonprofit corporation, funded by ticket sales, sponsors and an eventual membership program. Under his stewardship, TED launched a second annual conference held in a different international city each year and introduced the TED Prize grant. The first six official TED Talks were posted online in 2006, with Sir Ken Robinson’s speech going viral. His talk about how schools kill creativity remains the most watched TED Talk ever, with over 35 million views. Today, TED continues to expand, both its programs and channels of access. This past April, Charlie Rose interviewed the original TED founder, now 80 years old. Wurman speaks candidly about what he admires and doesn’t about the direction TED has taken. While Wurman concedes that Anderson grew TED in a way he lacked the skills to do, he confesses to feeling disenchanted at a recent TED conference. He went looking for “curiosity, community and conversation” and found something far more, in his mind, commercial and scripted. So he left early. Wurman laments that TED Talks today are choreographed, scripted and sponsored, suggesting they give up a certain degree of “truth.” Truth that Wurman sought to capture, in his more free-flowing, extemporaneous version of the conference. Scripts and sponsors notwithstanding, TED today has achieved something not possible in 1984, even 1994: It has made over 1,000 videos, on an enormous range of topics, shared by upwards of a thousand thought leaders, experts and storytellers, available to anyone with an Internet connection. For free. If even from our sofas, we each have a seat at that ultimate dinner party table. And because of TED, we all can probably claim some knowledge we might have otherwise never known. In our own effort over the last five years to bring you some new insights and bits of interesting information each month, we’ve watched a lot of TED Talks. In this issue, we’re featuring a selection of TED Talks we really enjoy, but have never gotten the opportunity to share. The reality of “lower for longer” oil and natural gas prices is settling over those of us in Houston and the oil patch. As acceptance takes hold, so too does regret over what feels like the end of a gold rush. This very well may be the case, but the oil and gas industry is not going away tomorrow. Numerous innovations over the last decade have provided the industry with ample residual economic opportunity. Adapting to a new normal for the domestic oil and gas industry will likely require a consolidation of producers into the hands of the best management teams and balance sheets. There will need to be a contraction of “picks and shovels” providers to better align those vendors with their customers’ new normal capital spending. This is how it works in a market economy. The gold rush never lasts forever, in any industry. Much like the ocean tides, economy will ebb and flow, forever. Lower oil prices are a boon to all transportation industries. Those lower transportation costs can trickle down into all manner of lower cost goods and services. Lower natural gas prices benefit the producers of plastic raw material and the producers of what that plastic becomes. Lower gasoline prices put more money into the hands of consumers, who can increase their spending on other things created by other industries. And lower power generation prices are of benefit to everybody, especially industries that require a lot of electricity. The ebb of one tide invariably influences the flow of another. Of course, Houston and other oil- and gas-centric economies will suffer challenges from lower overall economic activity. But let’s not forget that old saying…Necessity is the mother of invention. National unemployment is close to historic lows, yet the Federal Reserve continues to postpone raising interest rates. Why? Because overall economic activity is not robust enough to prove to the Fed that our economy is truly out of the woods. One bugaboo keeping the Fed insecure is the lack of wage growth that has plagued the “recovery” since the 2008/2009 Great Recession. It isn’t difficult to understand stagnated wages when we recall that the majority of jobs created since the recession are in retail, leisure and healthcare. These are service industries, and although Wall Street investment bankers and deal lawyers earn great money, the majority of service jobs do not. Service requires someone to serve, and historically that someone has been production. For decades, production jobs paid the greatest average wages. These wages trickled down to pay the service workers. But somewhere over the last decade, or two or three, our economy drifted further and further away from production and ever more into services, and now most recently into technology. That drift has greatly contributed to the stagnation of wages. The more service over production jobs we create, the more average wages stagnate. Additionally, technology has allowed companies to arbitrage the cost of labor around the world. High-cost labor jobs in developed economies have been exported to low-cost labor markets. This has also contributed to wage stagnation. General labor now looks to be just another over abundant resource. Meanwhile, the technology innovators that are bulldozing down industry upon industry are able to pay the greatest wages. These new companies are also generating much greater revenue and profit per employee than was possible in our old production industry model. Thus, we find a growing income gap between those working in new technology and those still stuck in the old paradigm. The most obvious solution to policy makers is to increase attention (read: spending) on education so we can produce more workers qualified for these new technology jobs. The challenge, though, is that not everyone can become an iPhone designer. We can’t shove everyone into the front end of the intellectual bell curve. A better balance between production, services and technology is needed to help wages rise. It will take better policy decisions out of Washington to help achieve this balance. Life is a 162 game season. The goal is to be in first place at the end of the season. Strive to improve every day. Be patient and persistent. Do good things. This analogy rings literal for our Houston readers. The Houston Astros didn’t just surprise us this year; they also greatly exceeded our expectations. Maybe this Cinderella team would not just make it to the playoffs, but also even keep the magic flowing right into the World Series. Of course as we all know, the Astros experienced a tragic fifth game loss to the Kansas City Royals. Only minutes before the wheels fell off for the Astros, Texas Governor Greg Abbot had apparently already celebrated victory on Twitter. Another day, another dollar, another lesson learned. Anyone who has felt a recessionary period knows there are ups, downs and all arounds over the course of a career, over the course of life. For those who put in the extra practice and effort, and for those motivated by creating worthwhile value, odds are that after the 162 games of careers and life, there will be worthwhile trophies to display…successful children, cherished friends, economic wellbeing. Data visualized. Data in motion. Data made beautiful. These two TED Talks remind us that data does not always have to be drab. Professor and global health expert Hans Rosling brings colorful life—and deeper meaning—to data. In his energetic talk on global health and economic data, Rosling debunks many myths of the developing world to prove a point: We have a problematic habit of generalizing data. In failing to slice and dice data, we fail to extract all the rich meaning it has to offer. Consequently, we chase blanket solutions to not fully defined problems. Rosling dreams of a world where we dig deeper into data, and he makes an entertaining case for it. Fascinated by the convergence of information and design, a data visualization expert summarizes the history of how humans have mapped data for a thousand years. Historically, the knowledge tree has been the predominant tool for visualizing information. But an ever complex, interconnected world demands a more flexible mode of visualization. Today, the tree has given way to the network, which allows a far more robust way to map systems. Watch for beautiful networked representations of information, and even a new kind of art. The BLS just published this series of longitudinal charts that show how the personal and working lives of Americans have evolved over the past 50 years. This particular data tracks the lives of two generational segments: Those born between 1957 and 1964 and those born between 1980 and 1984. Follow the link to scroll through nine interactive and insightful charts. A highlight follows. Millennials have a reputation for job-hopping. And we tend to think of boomers as having long careers at very few companies. 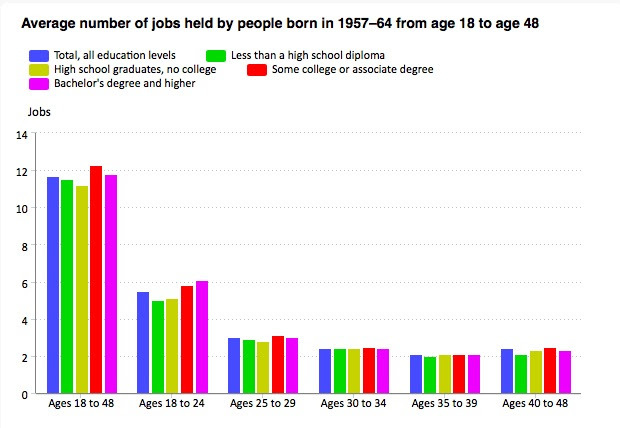 However, the following chart seems to indicate those in the second half of the Boomer generation did a fair amount of job-hopping themselves. 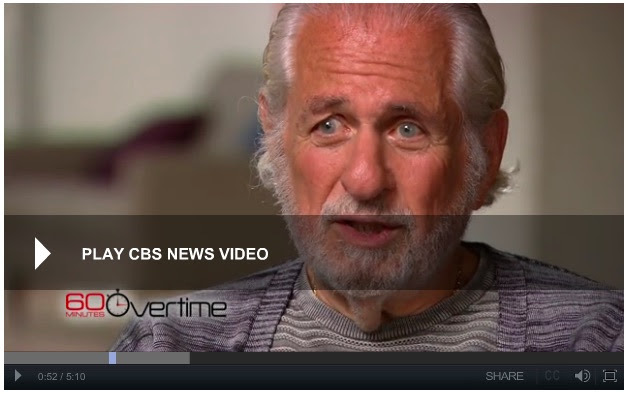 Richard Saul Wurman had the good sense to record every TED talk, from the first gathering in 1984 on. It was at that gathering that Nicholas Negroponte, who would go on to found the MIT Media Lab, spoke presciently about how humans would interact with computers and technology. In what was a two-hour presentation, edited down to 25 minutes for the TED site, Negroponte predicts the concepts and technologies behind touchscreens, service kiosks, website interfaces, to name a few. For more TED Talks from the pre-2006 vault, follow this link. Ok, hear us out. Once you watch this four-minute video, you’ll never forget it. And you might just find yourself minding its simple advice and drying your hands in the least wasteful way possible. Through examples sure to make you smile (e.g. in China, doctors only get paid when you’re healthy and not when you’re sick! ), entrepreneur Derek Sivers reminds us that all of our assumptions are contextual and arbitrary. Even when we think outside the box, there’s an even farther outside the box we’re not considering. Enjoy this three-minute jolt for a creative shake-up. Oceanographer David Gallo’s five-minute talk has been viewed over 12 million times. And with good reason: The deep dive reveals sea creatures that glow brightly in the dark and others that disappear into plain sight, totally changing their appearance to mimic the environment as protection from prey. This video is a must-see for anyone interested in the breadth and vibrancy of life. This next deep dive takes us under the Earth’s surface via channels of strange and fascinating caves that have revealed multiple new forms of life. Join a cave explorer and geologist as he and his team go into South American caves never before explored by man. What can their discoveries teach us? How might they advance our never-ending quest for cures for disease? Art and digital technology merge in this incredibly realistic visualization of how we all started, from the moment of fertilization to birth. A staggering fact: In weeks 13 to 16 of pregnancy, the fetus develops so rapidly that if it continued at that rate for the duration of a pregnancy, a baby would weigh 1.5 tons at birth. Watch the mesmerizing journey from fertilization to the brilliantly designed, complex creatures we are. At age 40, Nigel Marsh confronted a difficult reality. He’d become a “classic corporate warrior” who neglected his health, wellbeing and family. Desperate to reorder his life, he set out to determine how and if work-life balance can ever be achieved. His most poignant of four conclusions: “We need to face the truth that governments and corporations aren’t going to solve this issue for us…It’s up to us as individuals to take control and responsibility for the type of lives we want to lead. If you don’t design your life, someone else will design it for you, and you may just not like their idea of balance.” His motivating, ten-minute straight talk is especially for those whose work and personal lives feel out of whack. In this logically argued talk, philosopher Ruth Chang reframes difficult decisions as something with an incredible kind of power. Hard choices allow us to create reasons to make decisions and, ultimately, become the people we want to be. Hard choices segue into the creative opportunity to break free from the limitations that have been put on us (e.g. always buy because renting is throwing away money), and instead, expand our lives. Watch and see how the decisions we might find the most daunting can become the most exhilarating. In her emotional talk that feels more sermon than TED, Jill Bolte Taylor shares the story of the perceptive- and life-altering stroke that temporarily shut down the left hemisphere of her brain. Taylor vividly describes these moments when she operated free from brain chatter and with powerful awareness of her connection to all energy and consciousness. 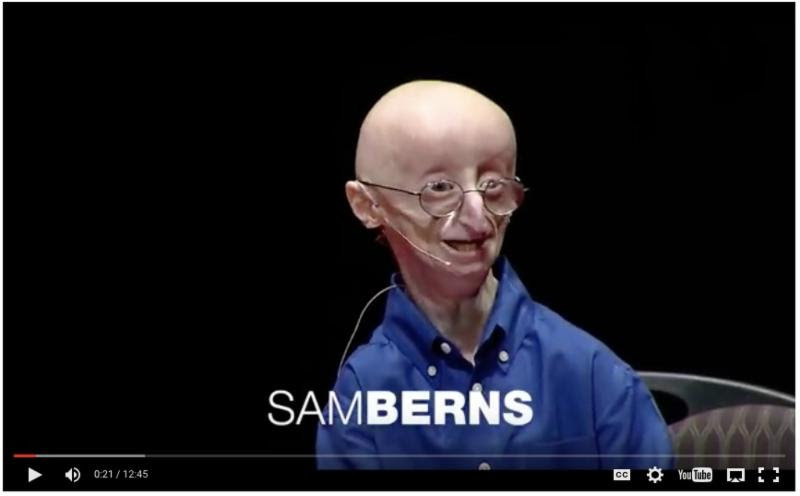 Junior in high school Sam Berns gave his TEDx Talk in October of 2013. He died just three months later at the age of 17. Berns was born with the life-shortening genetic disorder progeria, where aspects of aging manifest from a very early age. Despite enormous odds against him and the awareness he would die young, Berns found creative ways around his limitations and into the most typical childhood he could live. And with an inspiringly positive attitude. Watch for his simple and wise observations on what makes a happy life. Effective messaging—marketing, corporate, creative, personal or otherwise—is the result of intuiting just the right amount of clarity and mystery. When is each quality appropriate, and when is it disastrous? Celebrated book cover designer Chip Kidd has a clear knack for knowing when and to what extent to apply mystery. Kidd shares insights into his creative process, as well as critiques of failed and successful applications of clarity and mystery. Mad scientist or comedian? Hard to tell. Using science, stamps, shapes, square roots, systems, symmetry and our strange need to map everything and assign even stranger names, Charles Fleischer (known for being the voice of Roger Rabbit) asks the big question: Is there a numerical key to unlock the secret of the universe? Yes: Moleeds. And they are everywhere. The 4a.m. mystery: Coincidence or conspiracy? A performance artist suspects there might be a massive, global conspiracy around the wee hour of four in the morning…Fans then follow up with mountains of yet more evidence. It might be best to stay asleep at the mysterious hour. 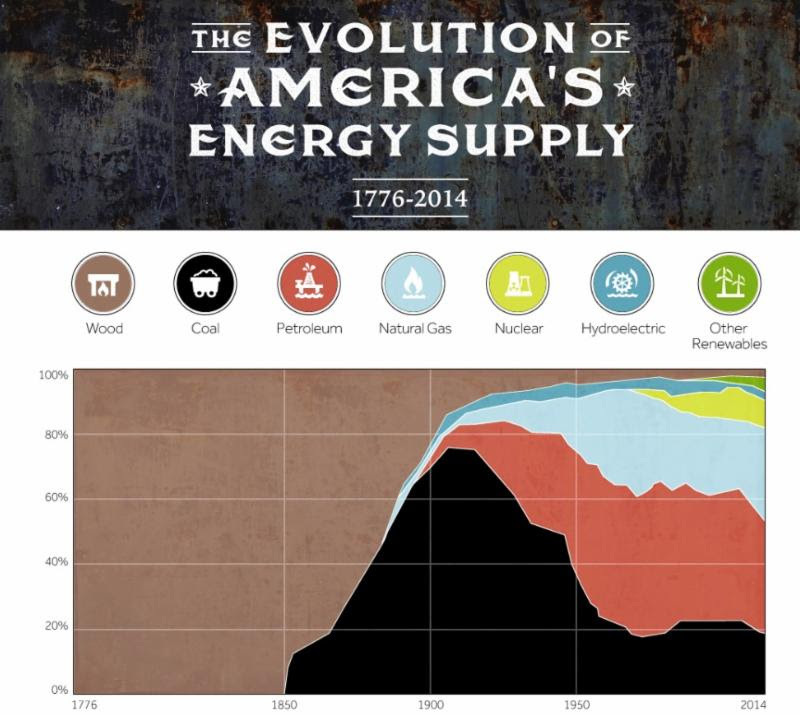 Follow the link for a historical summary of our energy supply since 1776. The chart captures what a game changer the discovery of coal was for technological and economic advancement, as well as how important oil and gas have been to our continuing economic prosperity. 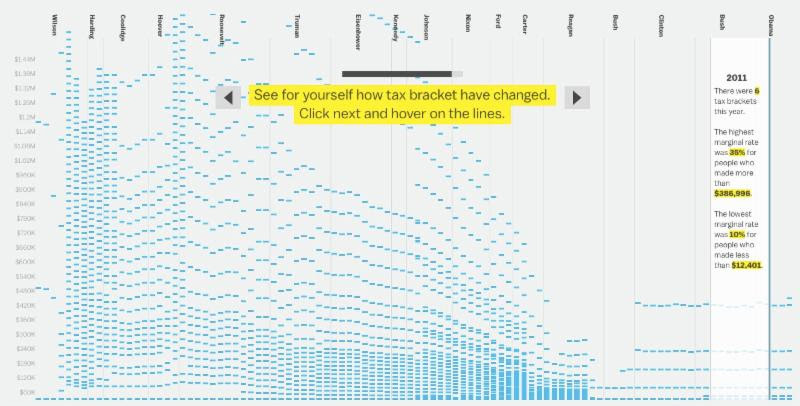 In the context of presidential candidates releasing their tax plans, many of which center upon reducing the number of brackets, Vox compiled a set of interactive charts that explore our history of taxation and brackets. Prior to President Reagan, we’d historically had dozens of tax brackets. Under President Kennedy, we had 25 tax brackets; the top rate for someone earning $210,000 was 54%, and for someone earning $1.5 million, it was 90%. Today, we have 7 tax brackets. Click the link or the image below to play around with the interactive charts. In this six-minute talk, leadership educator Drew Dudley believes we’ve put the notion of leadership on such a high, rarefied pedestal that most of us believe we can never reach it. He shares a funny story in his aim to redefine leadership as small acts with big impact that we can all achieve everyday. The number of women entering the religious life has been on a decline since the 1960s. But a small monastery in New Jersey has been able to attract 15 aspirants, nine of whom have stayed and are on track to take their final vows. How has this contemplative Dominican order been able to attract college-educated millennials? In a distinctly millennial way: social media and blogging. Read for a fascinating perspective on how the Internet is giving new life to nuns in New Jersey. With 15% of Americans counted as smokers (defined as someone who has both smoked more than 100 cigarettes during his or her lifetime and now smokes some days or every day), the metric is at its historical low. Smoking rates remain highest among young men; 17% of people aged 18 to 44 smoke, and 20% of men in that age range smoke.